This past weekend was one of the busiest weekends that we have had in a while. It was definitely fun filled, but I might be too old for that much fun because today I am exhausted! There was all the usual stuff like basketball games, friends, & church, but we had some extras thrown in too. We also went to a play, a super bowl party, and a concert. All weekend we were literally just going from one activity to the next. The highlight of the weekend for me was on Saturday. 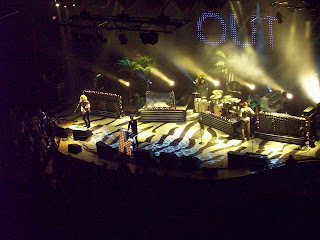 Chris & I had the chance to go to The Killers concert, and we had a really great time. Chris has actually been to one of their concerts before in Chicago when they were touring with their last album, but I haven’t had an opportunity to see them so I was VERY excited. This is actually one of the things I love about Chris. I would never on my own think to even look for, much less buy tickets to go to a concert. He, however, is always doing stuff like that and we always have the best time. We went with a friend and a friend of that friend (wow, there’s got to be a better way to say that) and I was laughing nonstop. Chris is really funny and always making me laugh and the friend that went with us is funny too. Now add in the friend of our friend who also happened to be pretty funny…I was seriously laughing the whole time! Anyway, all the laughing was great, but not my point, the point is that the concert was really fun. They had a great show, I love their music, and I love Brandon (the lead singer of the band). Now I think everyone realizes that there is just something about musicians that is really cool, otherwise there wouldn’t be all those groupies running around following bands everywhere they go. Although I’m definitely not ready to sign up to be a groupie, I will admit that when Brandon (in case you’re wondering, yes, Brandon & I are on a first name basis, I just happen to call him by his first name more than he calls me by mine) anyway, as he walked off the stage I wanted to yell for him to come back…don’t go Brandon, don’t go!!!! Much to my disappointment he did go, and now the fun filled weekend is over and I’m left trying to drink enough coffee to get me through the day. I can’t complain though, I truly don’t mind the exhaustion, all the fun was absolutely worth it! Also, the title of this post is a line from one of their (The Killers) songs in case you were wondering where that came from. It wasn't me...I'm certainly not that poetic. Too Fun! I love it! You kids are my kind of people.